Abraj Al Bait Shopping Mall located in Abraj Al Bait in front of the Holy Haram in Mecca, which is reputed to be one of the global tallest buildings , featuring the place six residential areas and hotels, Abraj Al Bait Shopping Mall is considered as largest Shopping Center in Mecca. The wonderful design of the hall of Abraj Al Bait Shopping Mall that has multiple floors, make the movement easy and can accommodate more than 250,000 shoppers a day. Abraj Al Bait Shopping Mall includes the most famous shops that offers hajj accessories and gifts of the most famous perfumes, prayer beads and prayer rugs to visitors and pilgrims, as it contains nearly 4,000 shops. 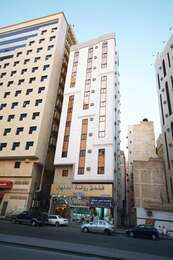 ,which offers international and local brands, and includes many of the restaurants, where the restaurants area can accommodate more than five thousand five hundred guests to enjoy international cuisine in fascinating atmosphere, which offers Middle Eastern, and Russian cuisines, where you will enjoy of unique shopping experience in Abraj Al Bait Shopping Mall.